The 50-mile-long Santa Monica Mountains parallel the coastline in Southern California, dividing the Pacific coast from the interior valleys. The western side of the range contains a maze of canyons that merge with the coastline, while the knobby ridge is exposed with weathered sandstone formations and volcanic outcrops interspersed with native grasslands and chaparral. As the range travels northwest from Los Angeles to Point Mugu, the urban areas gradually get replaced by thousands of acres of undeveloped land. The majority of the range is located within the Santa Monica Mountains National Recreation Area, the world’s largest national park at 150,000 acres. 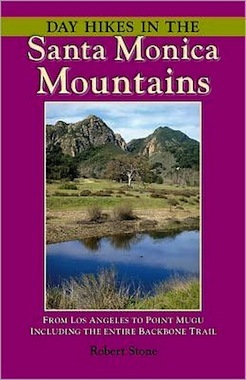 This newest hiking guide to the Day Hike Books series contains 125 hikes throughout the Santa Monica range. The 68-mile Backbone Trail is completely covered in an additional section of 13 hikes. Extensive maps and clear trailhead directions effectuate easy navigation to the trails. A variety of hikes accommodates every level of hiking, from short strolls along boardwalks to all-day coast-to-peak hikes. Highlights include fantastic sandstone landscapes, cool retreats along stream-fed canyons, gorges, waterfalls, coastal bluffs, filming locations, historic sites, and numerous 360-degree overlooks. Several hikes are found in Los Angeles’ Griffith Park, including a hike up to the famous “HOLLYWOOD” sign. Extensive hiking options are included for the other major centerpiece parks within the Santa Monica Mountains–Topanga State Park, Malibu Creek State Park, and Point Mugu State Park. The entire Backbone Trail is included in day-hike segments, crossing the length of the coastal range along the mountain’s ridge.